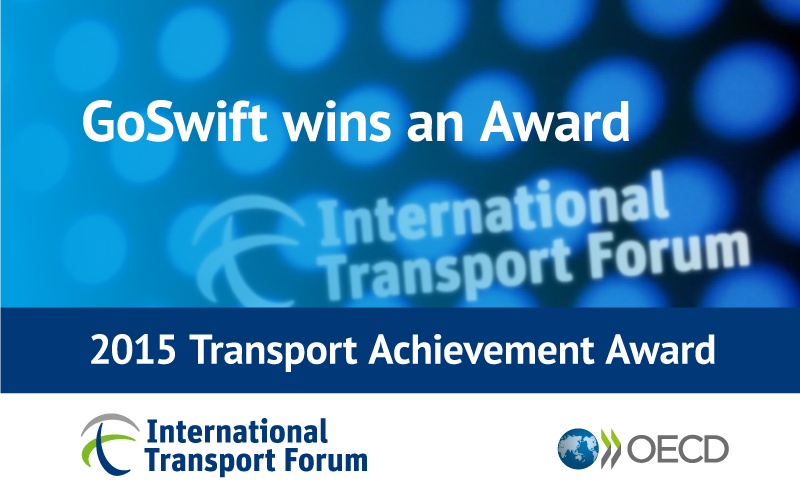 GoSwift has won a prestigious international award from the International Transport Forum at the OECD – the 2015 Transport Achievement Award. The Award recognises demonstrated achievement of excellence in transport provision that has improved, enabled or facilitated tourism. Trade and tourism statistics show increased activity across the border. Between 2010 and 2013, exports from Estonia to Russia grew by more than 66%, and the number of Russian visitors to Estonia increased by 35% in 2013. The Estonian Association of International Road Transport Carriers estimates that Estonian carrier companies have been able to save 4 Million Euros annually thanks to the GoSwift service. In awarding GoSwift the ITF Transport Achievement Award 2015, the jury noted the “excellent approach to facilitate border crossing”and applauded the positive impact the GoSwift project has on improving conditions for locals and drivers at the border as well as the wider economic benefits for tourism and trade between Estonia and Russia.